Fiilex has announced a new bi-colour LED light for photographers and videographers, the Q1000, with twice the power of the Q500. Fiilex has announced a new LED light for photographers and videographers, the Q1000. The new “flagship” lamp claims to have equivalent light output to a 1300W tungsten lamp while only using 320W of power. Colour temperature is adjustable from 2800–6500K and the output is fully dimmable from 100% to 0%. The Q1000 is weather resistant and supports power from a mains adapter or standard batteries. It weighs around six kilograms and is the same size as the existing Q500 lamp. 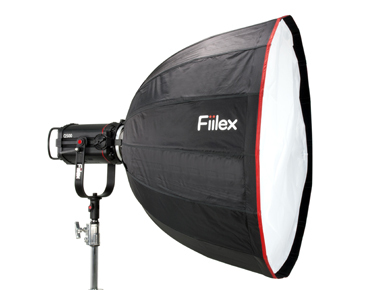 The Q1000 can be used with Fiilex’s P and Q-type range of accessories, including the new 35-inch Para Softbox they announced recently. The Para is a double-diffused 16-sided light modifier designed to cast a large, soft light on your subject, while still being easy to assemble and use. If you prefer using accessories from other brands, Fiilex recently also brought out a speedring that can be used with softboxes from Profoto, Westcott et al. The Fiilex Q1000 will retail for $3,495. For more information, visit the manufacturer’s product page.